This finely crafted combination side-scraper and graver made of St. Genevieve chert was excavated from the Phil Stratton site in Logan County, southwestern Kentucky (Gramly 2005). The Phil Stratton site is a closed or single-component encampment of the Cumberland archaeological culture. 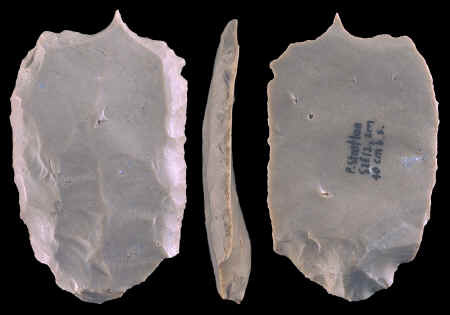 Completed fluted projectile points, point preforms, a variety of scrapers and utilized flakes – most made on prismatic blades – are among the 200 flaked tools recovered to date (7-22-05). The Phil Stratton site occupies a bluff above a ford across the meandering Red River, here deeply entrenched within limestone, and may have been an ideal place to intercept game. 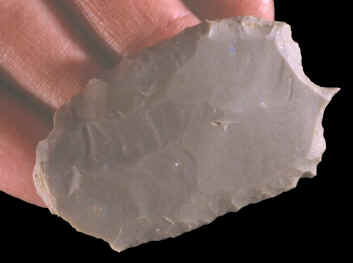 Gravels of the Red River also supplied tool-stone to Cumberland knappers, who left thousands of flakes at the Phil Stratton site. The age of the Cumberland culture is yet imperfectly known, although it is expected that the Phil Stratton encampment will yield some valuable clues. This combination graver and side-scraper was found during excavation on the Phil Stratton site in 2005. The bulb of percussion, where the blade was struck from the core, is still evident on the end even though it has been partially trimmed away by pressure flaking. This graver / side-scraper is made of St. Genevieve chert and it measures 2 1/4 inches (5.7 cm) long.